There seems to be some confusion over this - I for one don't understand it fully - but if Microsoft excludes the 1020 as a supported device, is there any point in enrolling in the Program? How did users who have installed a 10 Preview on the 1020 manage to do so? I have enrolled myself, choosing the Release Preview Ring, but it is not clear to me that that is intended for users who wish to upgrade from 8.1, or whether it's for those already running 10 who wish to download the latest builds and bug fixes. As others in this forum have noticed with their own devices, checking for software updates simply shows 'up to date'. There are indeed threads, but the Insider Program has never been easy to understand in its entirety, nor, so far as I am aware, has Microsoft ever tried to make it so, nor given much feedback. There remains unnecessary confusion in those threads. If the Program is useless on the 1020 and other phones, as I have long suspected, why doesn't some message come up saying as much? In fact, the Program can still be used to select this or that Ring, followed by a reconfiguration of the device, all of which is absurd if nothing can come of it. A simple "But there will be no updates" would have been nice. Earlier this year when we launched Windows 10 Mobile, we announced a series of changes to Windows 10 Mobile Insider Preview Program, including details of our launch of Windows 10 Mobile as well as changes to the supported Windows 10 Mobile Insider Preview devices. Unsupported devices can still use the Windows Device Recovery Tool to recover to Windows Phone 8.1, but will not have the option to return to Windows 10 Mobile. As always, we appreciate our Insiders and thank you for your participation in the Windows Insider Program. Last year around May I guess, the insider program was released and people could sign up and help in developing the next windows OS which we know as windows 10. It was available for both pc and for phones. 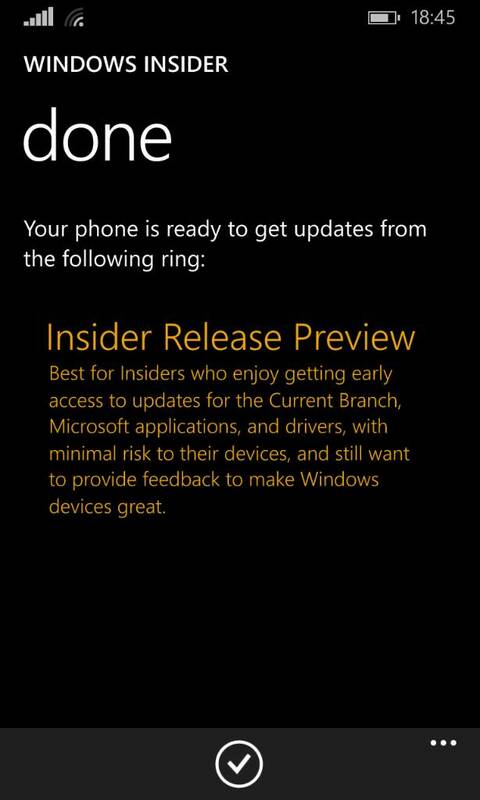 At the time, any phone could enrol and try the insider builds. Of course in the beginning the builds were hard on the phones but things go better. Over time the builds were stable enough to be released to the general public. However, from user feedback, it was noticed that some models performed much better than others when on W10M. Nevertheless, this bit is not true for me, because I can select, and the device reconfigures. Oh well.